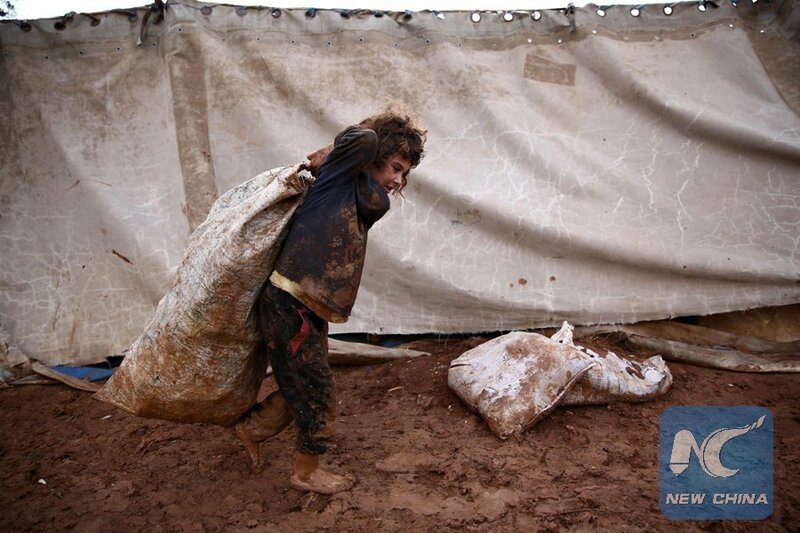 UNITED NATIONS, Jan. 30 (Xinhua) -- UN humanitarian chief Mark Lowcock on Wednesday stressed the need for access to Syria so that aid can reach people in need, particularly in the context of harsh winter. Lowcock, the UN undersecretary-general for humanitarian affairs, said an aid convoy is urgently needed for some 42,000 people stranded in Rukban along the Syria-Jordan border. Conditions in the informal settlement have continued to deteriorate since the last humanitarian convoy to the area on Nov. 3-8. Eight infants have reportedly died since last month. And the cold is making the situation even worse, Lowcock told the Security Council. "So it is critical that the parties support a second convoy to Rukban." The United Nations has been engaged on multiple fronts to ensure it can happen, including by addressing concerns expressed by Russia and the government of Syria about the security of the convoy and monitoring arrangements for aid distributions, said Lowcock. The convoy will include more than 100 trucks of relief supplies, focusing on food, winterization support and health, nutrition and household and water and sanitation items, as well as vaccination, he said. The United Nations received verbal approval on Sunday from the Syrian Foreign Ministry for the convoy to proceed. Security guarantees have also been received from Russia and international coalition forces, said Lowcock. "Planning is now under way for loading of the trucks to begin before the end of this week, and for them to set off by Feb. 5. We call on all parties to ensure that this goes ahead without any further delay." The team plans to stay in Rukban for at least a week, to ensure sufficient time to monitor distributions, carry out an intention survey to help identify a durable solution for those people in the informal settlement, and vaccinate as many children as possible, said Lowcock. In terms of security, it has been agreed that there will be a 5-km buffer zone between the armed groups present in the area and the convoy to avoid any interference, he said. However, protection for the accompanying personnel must be provided at the offloading point and the accommodation site, and security is needed inside the informal settlement to guard aid distribution, vaccination and the conducting of the intention survey, said Lowcock. The UN humanitarian chief also expressed concern over renewed violence in the northwest and the northeast. In the de-escalation zone of Idlib in the northwest, the risk of military escalation continues to loom, he said. The September 2018 agreement between Russia and Turkey that averted an offensive on Idlib by the Syrian government was followed by a significant decrease in ground fighting and airstrikes. However, January 2019 saw an increase in fighting between non-state armed groups, placing civilians at risk and resulting in injury and death, he said. "Today I reiterate the importance of sustaining the Russia-Turkey agreement and I remind you that a large-scale military operation in Idlib would have catastrophic humanitarian implications," he warned. Turning to the northeast of the country, Lowcock voiced concern about the humanitarian impact of ongoing military operations in southeastern Deir-ez-Zor governorate, where thousands have been displaced and an unknown number of people remain trapped under Islamic State control. Since December 2018, about 20,000 people, mostly women and children, have been displaced from the Hajin area in Deir-ez-Zor into neighboring Hassakeh governorate. Some 25 children have died, either in transit or shortly after arrival, he said. Lowcock asked for support from all UN member states to ensure that the parties respect and protect civilians, with particular attention to the northwest and northeast of the country, and to avert "at all costs" a full military offensive on Idlib and the surrounding areas.